I did not blog for 2 years. It's not that I did not try. I have about 8 unfinished drafts but somehow they are not so current anymore or would need a lot of work, so they are unlikely to ever appear. 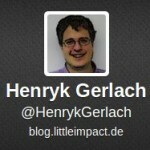 That's why I gave twitter a second try: @HenrykGerlach I also included it in my blog's sidebar so visitors see I'm not dead yet. I don't really like their terms, though.